I have been to Rosa Mexicano a number of times (three, to be precise). When I suggested it as a place for my father, my stepmother and MDP to go for dinner, my father asked, “Why haven’t you written about it on Taylor’s Ham?” So, here I am, writing about Rosa Mexicano. We chose the Union Square location because I thought it would be easier for them to get to from the Holland Tunnel. I had been to the Lincoln Center location for Restaurant Week one year, and found it to be lovely. The Union Square location is definitely trendier and much more hip. Loud music blares from speakers above. The brightly colored furniture sings under the dim lighting. Lucky for us, we got a nice table for four in the rear of the restaurant. We took our time ordering, but started with the signature guacamole. A visit to Rosa Mexicano would not be complete without a visit from the guacamole man. With large chunks of avocado throughout, the guacamole was perfectly seasoned (“medium,” as I had requested) and creamy. For appetizers–because we wanted to fully experience Rosa Mexicano–we got the special rock shrimp ceviche and queso fundido. As for the ceviche, you could taste the citrus fruit the shrimp had been marinated in, and it was quite delicious. Bits of mango dotted the dish, and it had a spicy kick at the end. 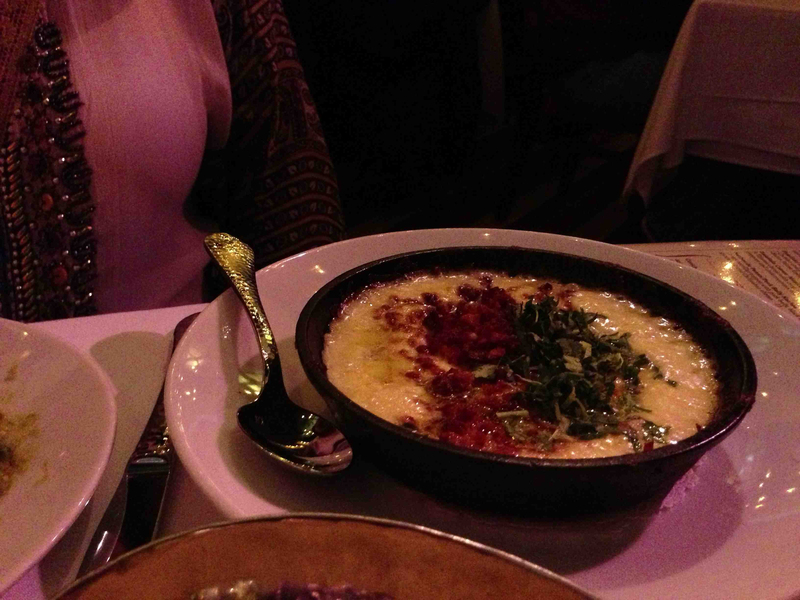 The queso fundido, which came with chorizo (which, for some reason, the waitress defined for us–as though we were tourists), was extremely scrumptious. Nice, little tortillas accompanied it, and I dressed mine with some of the stupendous guacamole. Yum! It was perfect. I ordered the pollo skillet style for my entree, which came with grilled Mexican street corn and chorizo chili on the side. Tortillas also made an appearance for this dish, and if you know anything about me, you know I love to make my own little sandwiches/tacos/fajitas. I happily constructed delicious fajita-esque roll-ups, and scraped off some of the chihuahua cheese that was baked to the bottom of the skillet to top the chicken and vegetables. MDP ordered the fish tacos, and I could tell he enjoyed them. My father and stepmother both ordered the tablones, which were slow-braised short ribs marinated in beer. They were outstanding! I highly recommend this dish. The meat was extremely tender and flavorful, and melted with the touch of the fork. Very good. And we ordered dessert and coffees, as well. MDP and I tried the tres leches de zarzamoras, which was sour cream pound cake soaked in three milks with a blackberry-hibiscus glaze and toasted meringue on top. It was divine! Highly recommend. My father also ordered the ice cream sundae, which was made with several of the ice creams they serve such as Mexican chocolate with all kinds of goodies on top. Very good, but the tres leches was better. 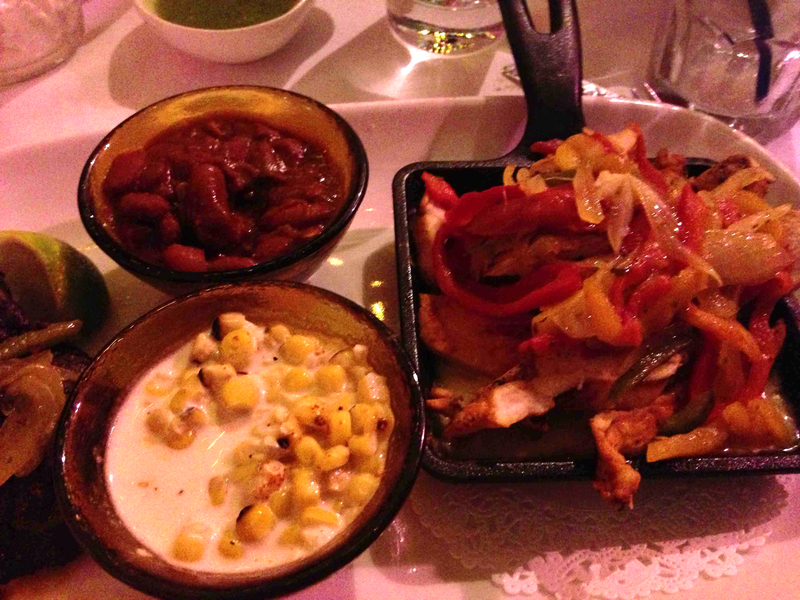 So, Rosa Mexicano is definitely the place to go for high-end Mexican food. And when I say high end, I mean that your bill will cost at least $120 for two (with drinks–which are outstanding, by the way. You must try the pomegranate margarita).